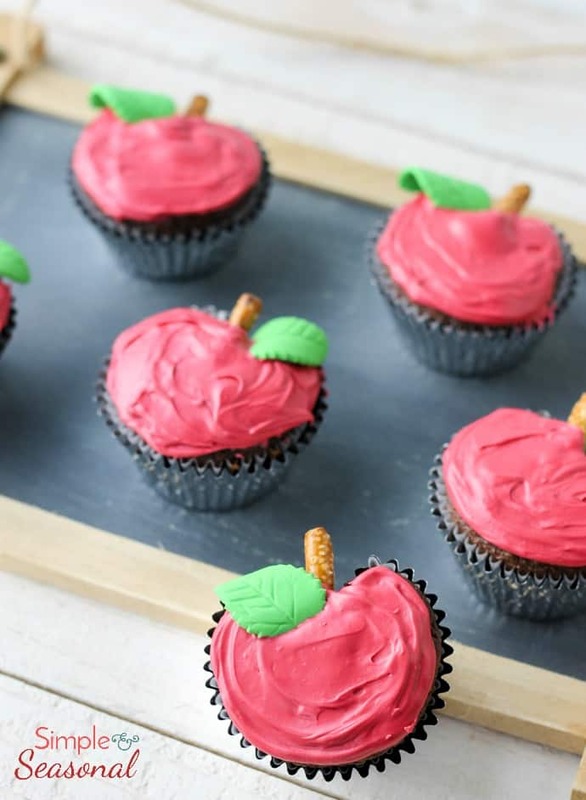 This back to school season, make up a batch of apple shaped cupcakes to celebrate the new year! I think fall is my favorite time of year. Not because I like the autumn season best, but because it ushers in so many other things that I love. That, and this blog is called Simple and Seasonal, so I pretty much love the changing of the seasons. I love the “newness” of back to school season, the cooling weather, the anticipation of the holidays and most of all-the FOOD. It’s time for the rich flavors of caramel, the warmth of cinnamon and ginger, hearty comfort food and sweets! We start school in two weeks, so it’s the beginning of it all right now! 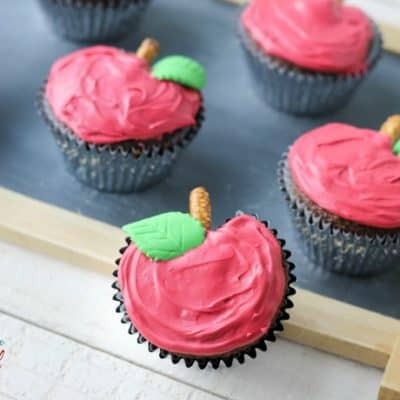 igured I would try my hand at making apple shaped cupcakes for the tail end of back to school season. I picked up some of these cute candy leaves at Joanne’s (in the baking aisle) added pretzel stems and I think they are pretty darn adorable! I’m not a school teacher, but I think I’d prefer one of these cuties instead of an actual apple on my desk. Actually, I’d take any kind of cupcake. I kinda have a thing for cute cupcakes. Check out my Slime Monster Cupcakes for Halloween, Easy Turkey Cupcakes for Thanksgiving or Snowball Elf Cupcakes for Christmas. So fun! 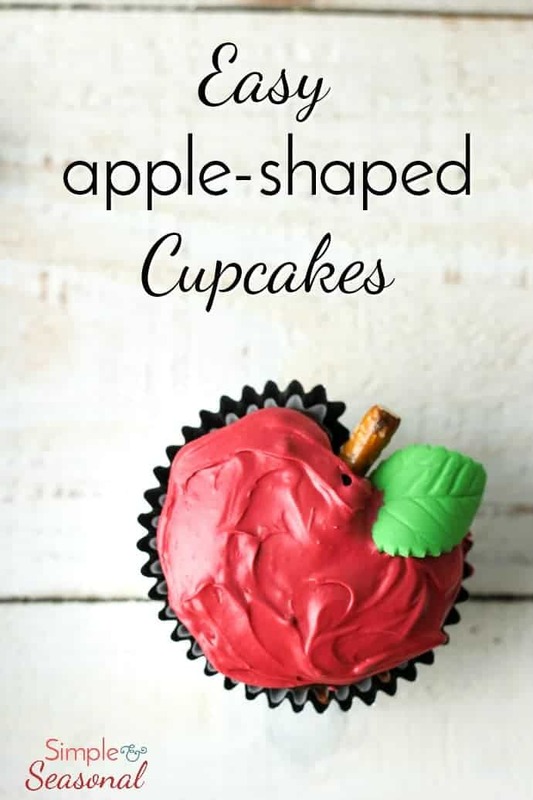 So, how do you get a cupcake in the shape of an apple? Well, the trick to shaping the apple is a little ball of tin foil! 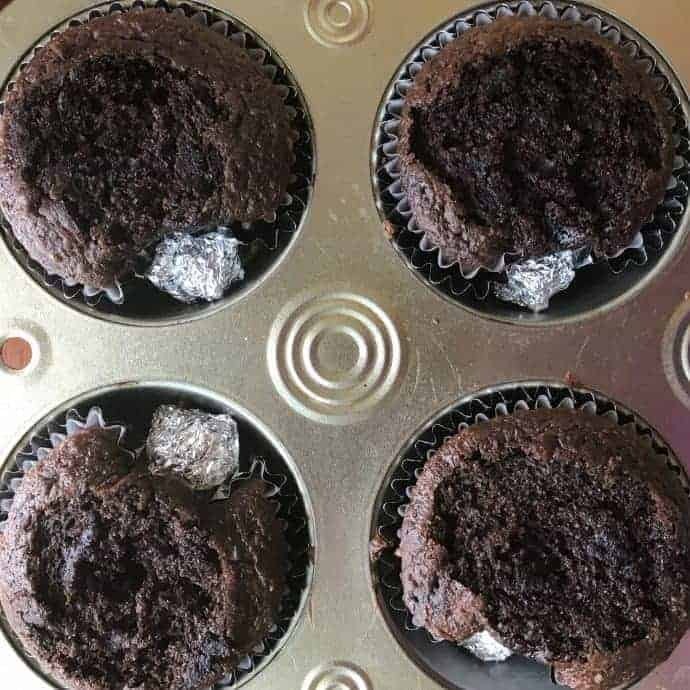 It is super easy, just roll it in a ball and place it in the pan before cooking and it will leave a small indentation in the cupcake. See the example below. 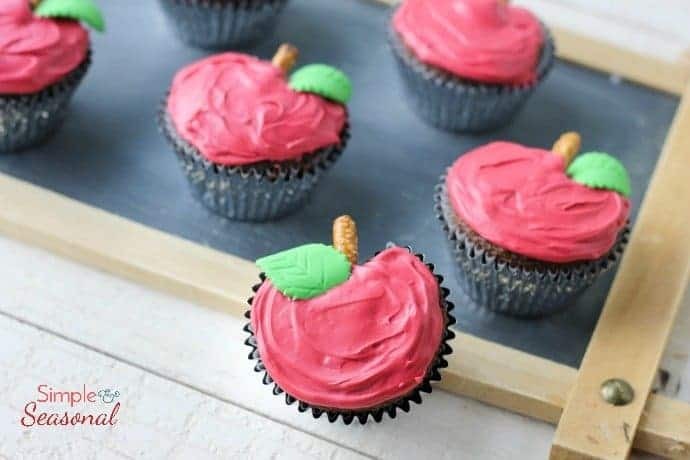 These Apple Shaped Cupcakes are perfect for Back to School celebrations or Teacher Appreciation Day. Prepare cake mix according to instructions on the box. Line a cupcake pan with liners and fill 2/3 full with batter. Don't overfill! Place a small ball of foil in the pan to shape the cake as it bakes. Once the cupcakes have cooled, you may have to cut the tops off a bit so they are flat instead of domed. Remove the foil balls. Color your frosting red and frost the tops smoothly. Cut the pretzel sticks in half and insert in the side (where the foil balls were.) Top with a candy leaf and you're done!